Oh yeah… what a week it’s been!……We had the Federal budget, a drop in interest rates and to top off the week The Voice 2016 kicked off. small businesses will benefit from a reduction in their tax rate to 27.5%. this will move to 25% for all companies within 5 years. A continued tax on smokers with cigarettes due to pay >$40 a packet shortly. Elsewhere in the world it is – Japan 250%, US 73%, Greece 180%. Overall the budget had little to say about he property industry. This may become more topical if the election is closer and the opposition’s policy of abolishing negative gearing comes into play. In the meantime growth is weak and the government knows this. That’s why there is so much spending going on with infrastructure, defense and interest rates are going downwards. This is positive for the property market. Housing affordability is at its most attractive level for decades despite strong rises in prices over the last 12 months. 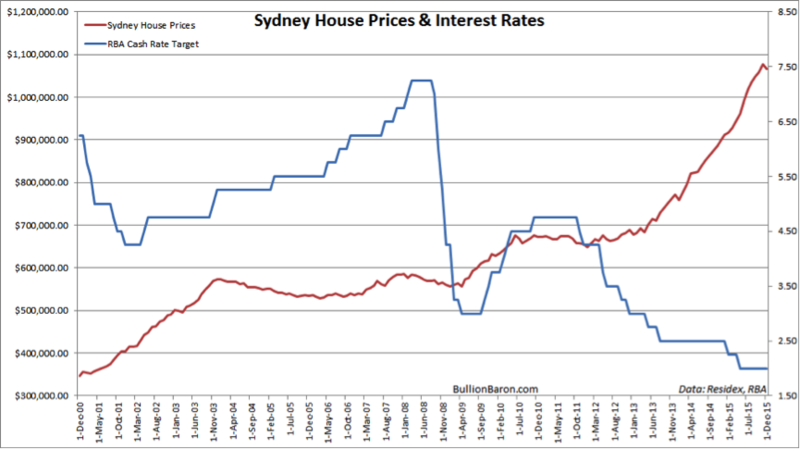 What the following chart shows is that as interest rates fall property prices rise. This is a strong relationship and suggests that as interest rates fall, the price that each household can afford rises dramatically. So lets focus on some positives for the week. Interest rates fell, we had a pretty benign budget and THE VOICE showed us that there is something to sing about again. As my 8 year old said to me today – DAD…May the 4th be with you!